Eleanor King is hoping that Wikipedia will be her new Facebook. "I'd much rather spend my time on the internet doing something productive," says the director of the Anna Leonowens Gallery. 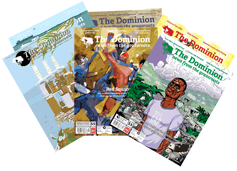 And "this free, open-source, community-based sum of all knowledge – to me it's a utopian place," says King. "To contribute to that is really exciting." King has recently made the move from Wikipedia reader to true Wikipedian, one of the more than 125,000 people that collaboratively write, edit, and fact-check the enormous repository of information that is Wikipedia. The inspiration for King's conversion? 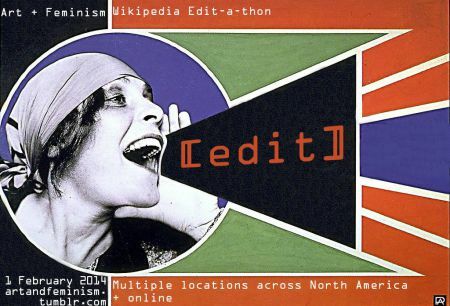 The upcoming Art + Feminism Wikipedia Edit-a-thon, an international event founded by New York-based art and technology non-profit, Eyebeam. On February 1st, hundreds of people will gather at sites all over the world to work on creating, correcting, or completing Wikipedia articles focusing on contemporary art and feminism. Thanks to NSCAD University Director of Library Services Rebecca Young, Haligonians will have a chance to join in the fun. Young felt the Edit-a-thon was a natural fit for the NSCAD library, because it brings together art, feminism, and also a focus on information literacy. And it's a chance to bring people together, too. "Since I've been in the library racket," says Young, "it seems there's fewer bodies in the library." "People are working alone a lot, and that's fine," says Young, but she's hoping the Edit-a-thon gathering will be an opportunity for "the spontaneous interactions that support new ideas and more collaborative work." According to a 2010 survey conducted by the Wikimedia Foundation, less than 13% of Wikipedia contributors identify as women. "That creates a bias inherent in the resource," says Young. "Women have less presence as notable human beings, with listings and biographies, on Wikipedia," says King, who is co-presenting the event with Young. For example, the Wikipedia article on Canadian artist Shary Boyle, who represented Canada at the 2013 Venice Biennale, is what is known as a 'stub' - an entry that's too short, providing only rudimentary information on a subject. But even a stub is something. Some artists of note are simply absent from Wikipedia, like NSCAD-affiliated artists Susan McEachern, Kim Morgan, and Ursula Johnson. "Our focus for this event is looking to find out where those holes are," says King. NSCAD art history professor Jayne Wark has charged some of her students with creating a biography for an artist they find interesting and underrepresented. McEachern, Morgan and Johnson have made the list. Young and King don't expect everyone to show up with a full biography on their to-do list. There's plenty of work for Wikipedians correcting, clarifying, and organizing existing articles, or expanding on stubs. King herself has yet to publish a new article, instead opting to edit existing articles. Even a recent spate of housekeeping work on the NSCAD University article, "was an empowering, exciting thing to do," says King. Another of her fixes involved a minor edit on an entry for the Art Workers’ Coalition, which listed a female artist differently than her male colleagues, creating ambiguity about her role. "I fixed it," says King. "It was just a silly formal thing, but to me it made a difference, so I changed it. It's really satisfying." The Pew Research Centre estimates that 53% of adult internet users internationally use Wikipedia to look for information. King and Young are asking people to come to the Edit-a-thon with a Wikipedia account set up, and the one-hour online training for students under their belts. But even the technologically-averse are welcome. "People can also contribute by being in the library and finding the citations," says Young. The Art + Feminism Wikipedia Edit-a-thon (Halifax satellite event) is taking place at the NSCAD University Library main floor, 5163 Duke Street, from 1pm to 7pm on Saturday, February 1st.